Heroes of the Storm is the only game we’ve ever called “a triumph”. If games had an award season, we’d say it was tipped for awards. 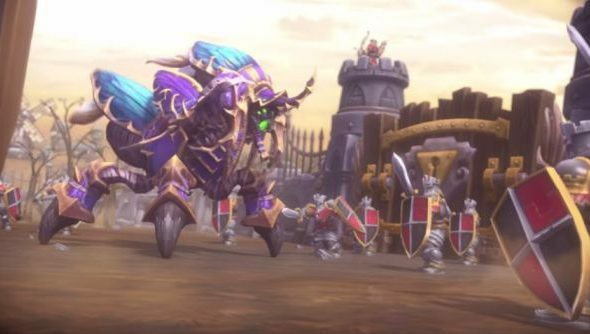 As the Blizzard MOBA emerges, bug-cleansed and account-wiped in the last stage of its technical alpha, Blizzard have advertised the addition of a former WoW boss to Heroes of the Storm’s roster: the insectoid undead king Anub’arak. Anub’arak was resurrected as a slave of the Lich King in an era of WoW I’m sure many of you remember. In Heroes of the Storm, he’s an “in-the-fray” melee fighter best used to initiate fights and force engagements. His trailer introduces the idea that Heroes of the Storm’s champions might actually retain memories of past events, and some self-awarness about the “strange place” they’ve been suddenly transported to for abstract 5v5 matches. Best not to think too hard about that. Instead, consider the possible skillset of a well-mandibled, back-plated insect lord. We see Anub’arak turning up the surface of the map, charging at an unfortunate hero and sending them flying when he emerges beneath their feet. You probably also noticed the lines of spiked protrusions he caused to jut from the earth, spearing enemies. And the smaller insects he called forth in a radius. And the paralysing web that covered opponents. That sounds like a set of abilities to me. What do you reckon?